An open secret of modern armored cars is they’re easy to build in large numbers. Sophisticated production facilities aren’t needed either. This explains why, for the past 10 years, mine-resistant vehicles have proliferated across the globe. Rather than corner the US Army surplus market, some companies prefer building their own vehicles. Like Streit Group. To date, the Canadian multinational offers dozens of armored vehicles in several categories. 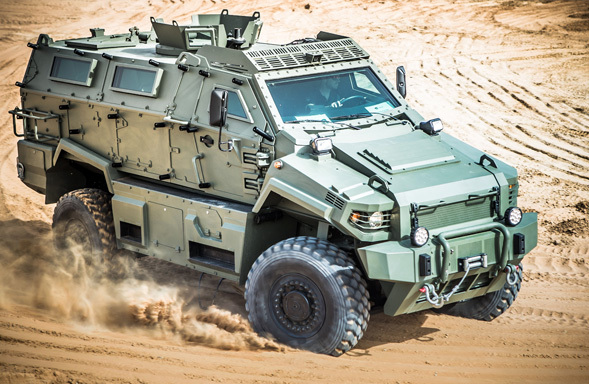 Earlier this year, Streit Group unveiled its Matador 8×8 APC at an arms shows. This marks the latest breakthrough for a firm whose original product line used to consist of bullet-resistant vans. Then there’s Streit Group’s selection of MRAPs. Depending on customer requirements, Streit Group offers five different vehicle types that pass mine-resistant standards. The most impressive in their product line, however, is the Typhoon. Not to be confused with a Russian armored car also called Typhoon, the Streit Group’s own Typhoon is a modular MRAP with bespoke features. The Typhoon runs on a 400 horsepower Cummins turbo diesel engine. Its top speed is 105 kilometers-per-hour and the Typhoon’s product literature boasts a range of 1,000km. Unveiled in 2011, the Typhoon’s capabilities have expanded over the years. It’s now available in a 6×6 configuration. Its protection level varies and can reach STANAG IV. But the original Typhoon was a STANAG II vehicle, making it impervious to small caliber firearms. The Typhoon’s appearance is typical for MRAPs, with a reinforced bumper underneath a large grill. A sloping armored hood houses the engine. External storage bins are located on either side of the monocoque hull. The Typhoon fits a driver and co-driver along with eight passengers, who enter and exit from a rear door. A circular roof hatch is convertible to an armed turret. Two additional roof hatches are found at the rear. Bulletproof windows with integrated firing ports allow passengers to fight from within the vehicle. Streit Group, whose corporate logo is a tortoise, already has more than 20 years experience selling bespoke armored cars for VIPs. The Typhoon is just one among a selection of vehicles in its growing military and law enforcement product line. Streit Group was founded in 1992 by the Russian immigrant Guerman Goutorov and the Bulgarian mechanical engineer Anton Stefov. Working out of a rented garage in Toronto, Streit Group established itself as a workshop for armoring civilian cars. Streit Group expanded rapidly in the 2000s thanks to new investments and strong demand from emerging markets. Streit Group is now an international enterprise with facilities spread across nine countries–including a massive factory in Ras-al-Khaimah, UAE–and offices in 25 global locations. 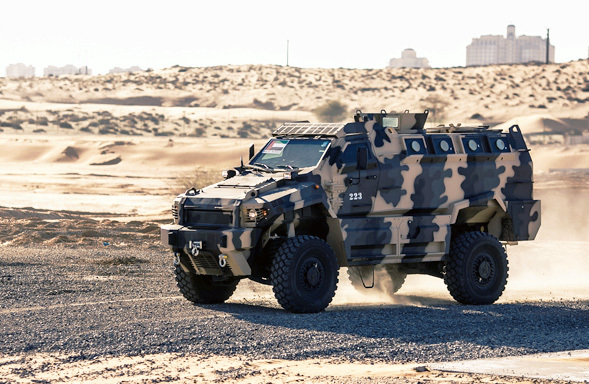 Streit Group’s recent victories include huge contracts for armored cars in Africa and licensed-production of its 4×4’s in Ukraine.